The Book Lantern: YA Books from My Side of the Pond! YA Books from My Side of the Pond! Like many Scots, I tend to get a little feverish when it comes to my national pride. Since I know nothing about sports, the usual outlet for such patriotism, I use literature as a way to express my occasionally smug pride. While Scotland is known for some of its more recognizable writers – Walter Scott, J.M. Barrie, Robert Burns, Muriel Sparks, etc – there are a ton of great Scottish authors writing books for children and teenagers who are seldom mentioned outside of specialist websites and half empty reviews, so I thought it was about time to honor those writers, spread the good word about some of their under-appreciated work and maybe just prove once and for all that I’m not a complete hater! “Exodus” and “Zenith” by Julie Bertagna. Synopsis of “Exodus”: Less than a hundred years from now, the world as we know it no longer exists. Cities have disappeared beneath the sea, technology no longer functions, and human civilization has reverted to a much more primitive state. On an isolated northern island, the people of Wing are trying to hold onto their way of life - even as the sea continues to claim precious acres and threatens to claim their very lives. Only fifteen-year-old Mara has the vision and the will to lead her people in search of a new beginning in this harsh, unfamiliar world. This compelling and powerful story set in the near future will hit home with teens, especially those who are ever more aware of the increasingly controversial climate crisis we face in our world today. Before dystopian YA had become the next big fad on the market, Julie Bertagna was blowing my just-turned-teen socks off with her gripping and often grim tale of a world left underwater due to global warming, returned to a less civilized time. Put the Waterworld comparisons out of your mind; this is a much more exciting story than that, anchored by a strong, resourceful teen girl. It’s been a while since I read the books so I admit that my youthful nerdery in training may have rose tinted my views of the book but with the final part in the trilogy, “Aurora”, finally being released this year, I highly recommend the series for those who want in on the dystopian craze without the overpowering publicity machine behind it. Synopsis: The destinies of two Scottish families, one of shopkeepers and one of wealth and power, become entwined through their involvement in World War I, social causes, and love. For all of the time I spent devouring crime novels and thrillers about serial killers in my youth (which says a lot about me, to be honest), this is the book that’s stuck with me the most from my adolescence. It’s a quiet book that really packs a punch and manages to convey huge issues and very sensitive history in a completely relatable and readable way for teenagers. I think it stuck with me the most because I was around the age of some of the characters in the book and the idea that I would have been old enough to have been in the middle of that chaos at the time genuinely terrified me. I was also fascinated by the roles of women at the time and how much we’ve changed; the theme of change is hugely important in the novel. I highly recommend this, along with some of Breslin’s other work, which features in almost every genre of YA. 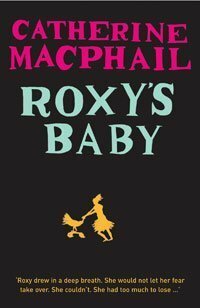 “Roxy’s Baby” by Catherine MacPhail. Synopsis: Roxy is wild, uncontrollable. She hates her parents - and her goody-two-shoes sister. Her only solace is her equally wild friends, Pat, Tracey and Jacqueline. Then there is the night of the party, where she lets that boy kiss her, and more and Roxy is pregnant. Wilfully, she won't tell her mother, her family. She decides to run away to London. And in London Roxy is found by Mr and Mrs Dyce. They are understanding, sympathetic, and promise her a way out of her troubles. They will take her to a comfortable place, along with other girls in the same position and look after her and her baby - which is exactly what happens. Roxy cannot believe her luck. But Roxy eventually works out the dark truth of the outwardly genial Dyces. They are 'farming' the babies in a truly horrible way, and selling the baby organs. There is only one dramatic way out for Roxy - and it's dangerous. But she is dealing with dangerous people and she has to take it. And now she has her baby to look after. I had a hard time picking one MacPhail book – she’s a very prolific writer who has written in a number of genres and gotten quite a bit of acclaim for doing so on this side of the Atlantic – but I decided to pick arguably her most famous one (which also comes with the seal of approval from my younger sister.) Considering the content (which was based on real life events, believe it or not), the book was in serious danger of turning into a farce but I found that MacPhail handled the topic very well (although I’ve heard varied opinions from other readers regarding the book too). It’s more aimed at a younger teen audience but it’s still highly readable for all ages. Obviously, with a synopsis like that, it’s not for the faint hearted! Synopsis: dinburgh, 1822. Young Robbie is just eight years old when he witnesses his mother’s agonizing pain and then death from the removal of a breast tumor during public surgery at the hands of one savage surgeon, Dr. Knox. The sounds of his mother’s piercing cries haunt Robbie as he and his hapless father and baby sister try to go on. But life proves bitter when Robbie’s father loses his business and disappears. Years of poverty go by as Robbie cares for his sister in the Edinburgh slums. Fueled by anger and grief, the teenaged Robbie seems to be heading for a life on the wrong side of the law when he helps the men providing “the butcher Knox” with dead bodies for his medical research. For years, Robbie thinks of Knox as his mother’s killer and wants revenge. He’s convinced that Knox is involved in a murderous trade in bodies for experimentation and plans a confrontation. It will take time to see the motives behind Knox’s corrupt methods. Perhaps there will be a way to give some meaning to his mother’s tragic death after all. I’ll admit it up front: I love the entire Dr Knox history. Living in the fair Scottish capital means I get the chance to walk around all the infamous locations of Edinburgh, known for murder, grave-robbing, hangings and even a little cannibalism. So this book was clearly written with me in mind. I highly recommend Morgan’s work, including her book “The Highwayman’s Footsteps” (another area of history that I was a bit obsessed with growing up) but I chose “Fleshmarket” because it’s a fascinating glimpse into the darker recesses of history with a very gripping hero at the centre of it. It’s not a particularly gory book but the weaker stomached among us may want to pass by it – and pick up her other work! The Kevin and Sadies series by Joan Lingard. Synopsis for “The Twelfth Day of July”: The first chapter takes place in a Protestant street. Tommy and Sadie Jackson are already looking forward to the 12th day of July which is a Protestant celebration day. Meanwhile, Catholic Kevin McCoy is out causing trouble in the Protestant part of town. What will happen when Sadie and Kevin meet? Can they become friends when everyone else in Northern Ireland is so full of hatred against the other religion? When I worked in a bookshop over the Xmas period (I miss that job so much), this series was incredibly popular with adults so we kept it in the adult section even though it was originally meant for teenagers. Regardless of your age, the series is a wonderful, touching read with a romance at the centre of it you’ll actually want to succeed (maybe I’m just getting old and cynical but lately romance in YA just hasn’t been doing it for me in the same way it used to, like with this series) and complicated political and religious problems handled with great skill. Lingard’s an incredibly prolific writer who still writes for adults and kids to this day (the first Kevin and Sadie book was written in the 60s so it’s got brilliant staying power). “Ostrich Boys” by Keith Gray. I’ll admit, I haven’t actually read this book but it’s been on my radar for a while (It’s won multiple awards, comes highly recommended and has a fantastic title). So there’s my brief list of things you should go check out. There’s also this author called Joanne Rowling who wrote a series of books while living in Edinburgh but I’m sure you’re not that interested in her. If there is any further interest in this, I may do a post on under-appreciated MG and YA novels from all around Britain. Hope you all got some good recommendations from this list and don’t be afraid to ask for more because I have plenty! Disclaimer: All synopses are taken from GoodReads. I'm a Scottish YA book blogger and this post is such a fantastic idea. I've been toying with doing a series on Scottish titles for a while but was struggling to come up with many - this has inspired me to not only check out these titles but also to research further books from Scotland. Cheers! (Also, awesome blog - just discovered you and shall be reading avidly from now on). I saw Exodus on the shelves of my university's library. On a number of occasions I checked the book out to read but never actually got around to it. I'm thinking I definitely need to now. Awesome! I'll definitely be checking some of these out - they're really in my field of interest right now! Thank you so much for mentioning Remembrance. As a big fan of good YA, and someone who's fascinated with literature dealing with WW1, I absolutely adored this book. (Is it okay if I do my bit of recommending here? Have you heard of an Irish book called Skippy Dies? It's a comic-tragedy about an ensemble of teenage boys and teachers at a modern Dublin boarding school; it opens with the suicide of Skippy, then spends half the book in flashback dealing with the events that led to his death, and the other half with his friends, ex-girlfriend, teachers and peers trying to deal with and accept his death. It also draws in on a lot of metaphors and references about WW1. It's one of the only books that's ever made me cry. If you haven't already and ever have time, please, please, please read it).